If you had to choose one folding knife to do everything — one knife to carry in your pocket for every trip and task — what would it be? After more than five years and 250 systematic knife reviews, I’ve landed at the same blade as many others with the Spyderco Para Military 2. The purpose of the “one knife” thought experiment (let’s be honest, it will never be more than that as none of us want to be down to only one knife), is to figure out what single knife does well in most circumstances. 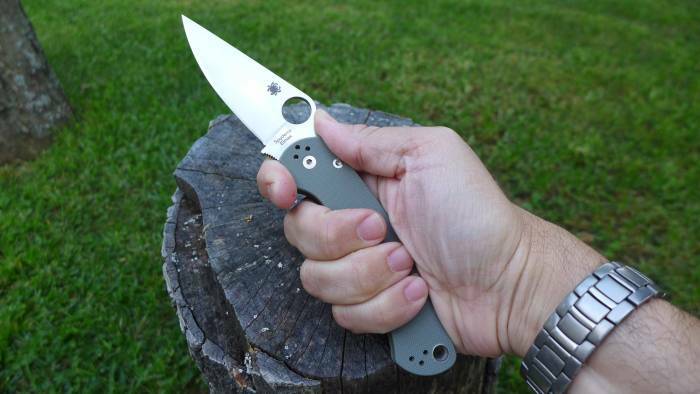 And, no, Spyderco did not pay me to write this. See below for some justification. 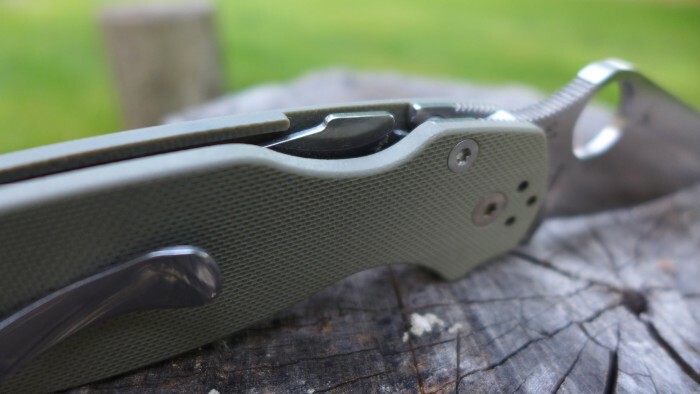 The Para Military 2 can be pressed into very hard use, borderline abusive tasks, and it can be a daily companion to open up packages and the like. It has a medium-size blade, with a 3.44-inch cutting edge. It’s made in the USA and comes with Spyderco’s trademark Spyder Hole opener, which I like. It also uses a lock design exclusive to Spyderco — the Compression lock. The lock is a marvel, combining the space efficiency of a liner lock with the strength of something much beefier (the locking leaf’s width, not thickness, is the weight bearing dimension). The design is also very light and thin. Thanks to fully milled-out liners AND recessed pockets for those liners in the G10, you get a knife that feels as stout as any folder in the hand, but slips in and out of the pocket with ease. Spyderco put a very acute full flat grind on the knife, thinning down the stock to an edge that works like a high-end kitchen knife around a cutting board. Thanks to thick initial stock and the awesome lock, the PM2 can also flex into a hard use roll. I have used mine to cut such wicked stuff as used linoleum (glue and all), small trees, and old tires. 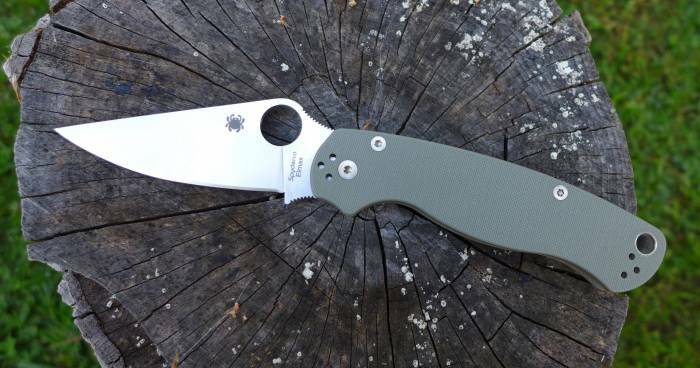 One other delightful thing about the PM2 is the fact that it is available (for a price) in just about any combination of steel and handle scale color you want. You can track down one of the many Sprint Runs (defined by Spyderco as a Limited Edition Production of any Spyderco product in a configuration different than what has been previously produced) and get almost any high-end steel you can think of, or you can opt for the stock version that runs the still quite good S30V. There are PM2s with blue, orange, camo, black, and brown G10 handles and a pair with carbon-fiber scales. The PM2’s success has also given rise to a veritable cottage industry of replacement scales and clips. You can find PM2 upgrades from Lynch Tools, Cuscadi, and Allan Putman, to name just a few. The PM2 is also the hands-down favorite for aftermarket modders. Its complex design is often seen as a benchmark for a modder’s skill. If you can mod a PM2 cleanly, you can do just about any production knife. The size, weight, steel availability, and cutting performance makes the PM2 an easy choice for my “One Knife” and something worth tracking down if you want an awesome do-everything folder for a decent price.